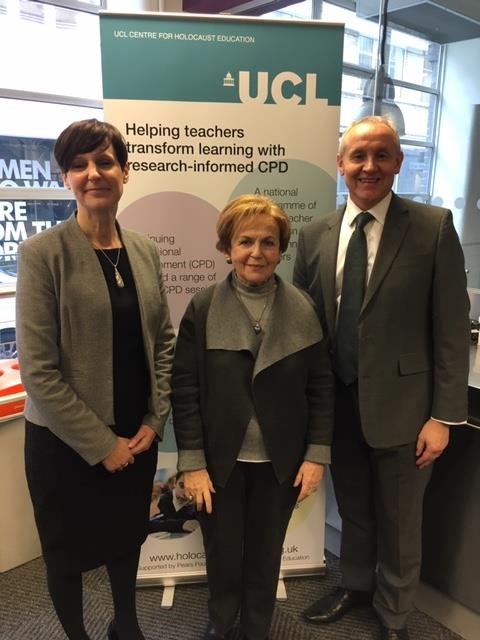 Today, January 24th, UCL Centre for Holocaust Education colleagues joined together to mark Holocaust Memorial Day (HMD). Outlining the Centre’s support for Holocaust Memorial Day, Nicola Wetherall MBE introduced the national theme, Torn from Home’. ‘The idea of home is one which, for many of us, evokes strong emotions. In the process of our evolution, such spaces have offered shelter and protection, enabling us to exist within our environments. Building a home, in a literal sense, has therefore been integral to our survival as a species. Of equal importance are the processes of making a home and feeling at home. Here, home is more than simply a physical construction which offers safety and security; it is also a place where we feel comfortable and content, and duly able to live our lives. For these reasons, amongst others, the prospect of having “home” forcibly taken away from or denied to us is something which we instinctively rile against. Sadly, acts of human atrocity such as war and genocide invariably see such things occur. In these cases, something more than places of habitation are destroyed. In the 1930s, the policies of Nazi Germany against Jewish men, women, and children within its borders created immense upheaval, dislocation, and – increasingly – displacement’. Taking the opportunity to acknowledge the blog contributions, written for the Centre’s website and published this week, by survivor Eva Clarke, Headteacher George Croxford and the Centre’s own Ruth-Anne Lenga, Nicola gave one example of being torn from home, reading the beautiful and moving account of Lord Dubs kindertransport. But what of the Greenman family – who are so embedded in the Centre’s materials and courses? Ruth-Anne took over the story, and Leon’s testimony clips recalled the moment of rupture in the most powerful and compelling of ways. This was a fitting combination of both memorial and educational legacy. In keeping with today’s intimate, informal commemorations there was a moving candle lighting ceremony in memory of victims of the Holocaust, led by Rabbi Broder. Mala spoke of her ‘ordinary, unremarkable’ pre-war life, before movingly, sharing her compelling experiences of being ‘torn from home’. Her testimony, like that of all survivors who share their stories with others, especially in schools, is a precious gift – and, as Elie Wiesel said, “When you listen to a witness, you become a witness.” –there was a palpable sense of that among the young people listening so attentively to Mala’s story. The Core Trust’s Echo Eternal Project. These schools and projects demonstrate just what is possible when teachers are given specialist CPD and support to tackle challenging, sensitive and difficult issues like the Holocaust and genocide. In a world of increasing antisemitism, heightened ‘them and us’ thinking, the work of the Centre and these schools is needed more than ever. Carl Wilkens reminds us ‘Genocide stems from thing “My world would be better without you in it’ – who that ‘you’ might be. This is nonsense of course, focusing as it does on self rather than community and civics. We need to flip it to ‘our world’ thinking, to say ‘Our world would be better with you in it’ – to challenge hate, division and prejudice with principles of rights, respect, empathy and inclusion. Empowering young people to safeguard the future by learning about the past is not just schools’ and teachers’ responsibility, it must be a wider civic and community endeavour, but each year, on Holocaust Memorial Day, we at the Centre affirm our commitment to playing our part. There is much work still to do; but today this Centre pledges to support teacher and schools in that endeavour to ensure Alf, Leon and Mala’s stories, and the Holocaust is not forgotten, denied nor misunderstood. **Centre colleagues will join survivors, educators, politicians, religious and civic leaders at the HMD national ceremony in Westminster on January 27th.